Terion Moss is Mr. Maine Basketball and Kolleen Bouchard is Miss Maine Basketball. 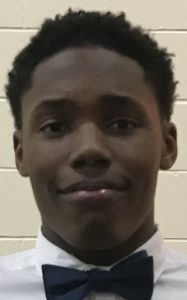 Terion Moss of Portland High was named Mr. Maine Basketball on Friday night, and Kolleen Bouchard of Houlton High was named Miss Maine Basketball. The awards, given annually to the top senior boy and girl in the state, were presented by the Maine Association of Basketball Coaches at a banquet at the University of Southern Maine in Gorham. Moss led the Bulldogs to a 17-3 record and the Class AA North semifinals this season, averaging 19.9 points, 4.6 assists, 4.0 rebounds and 2.9 steals. Moss was named the Maine Gatorade player of the year earlier this week. Bouchard won four regional titles and two state championships with Houlton. She passed the 2,000-point mark for her career in a regional final win over Dexter. Bouchard has committed to play at Bentley University. PGA: Tiger Woods put on a show before thousands of fans at the Valspar Championship. Corey Conners settled for a quiet afternoon and the lead at Innisbrook in Palm Harbor, Florida. Woods looked sharp with four birdies and kept a clean card until his last hole. He still shot a 3-under 68 and was two shots out of the lead. Conners, a Canadian rookie, made three quick birdies on his way to a 69 and his first 36-hole lead. Paul Casey, Brandt Snedeker, Ryan Palmer and Kelly Kraft joined Woods two shots back. CHAMPIONS TOUR: Tom Pernice Jr. shot a bogey-free 7-under 64 for a three-shot lead in the Toshiba Classic at Newport Beach, California. Seven players were three shots back. EUROPEAN TOUR: Emiliano Grillo took a four-stroke lead at the Indian Open in New Delhi after shooting 4-under 68. Shubhankar Sharma was in second after an 8-under 64, the best round of the day. G LEAGUE: Raphiael Putney scored 27 points, John Gillon added 23 and the Erie BayHawks held on for a 114-108 victory over the Red Claws at Erie, Pennsylvania, eliminating Maine from the playoff chase. Devin Williams had 20 points and 21 rebounds for his 18th double-double of the season to lead Maine (17-28). Maine worked away at an 18-point deficit in the final 51/2 minutes, pulling to within 110-106 with 24 seconds left, but Erie (25-19) knocked down four free throws to seal it. NHL: Boston Bruins winger Brad Marchand was fined $2,000 by the league for embellishment. Marchand was warned for an incident Nov. 29 against Tampa Bay and fined for embellishing a trip by Olli Maatta of Pittsburgh on March 1. • Buffalo Sabres forward Kyle Okposo is out indefinitely with a concussion. • Dallas Stars center Martin Hanzal is set for back surgery that will end his season. • Seth Jones scored twice and the host Columbus Blue Jackets beat the Detroit Red Wings 3-2. • Sam Bennett and Matt Stajan scored for the Calgary Flames in a 2-1 win over the Senators at Ottawa, Ontario. BNP PARIBAS OPEN: Serena Williams won her first match in her return after a 14-month layoff for the birth of her first child, beating Zarina Diyas of Kazakhstan 7-5, 6-3 in the first round at Indian Wells, California, on Thursday night.